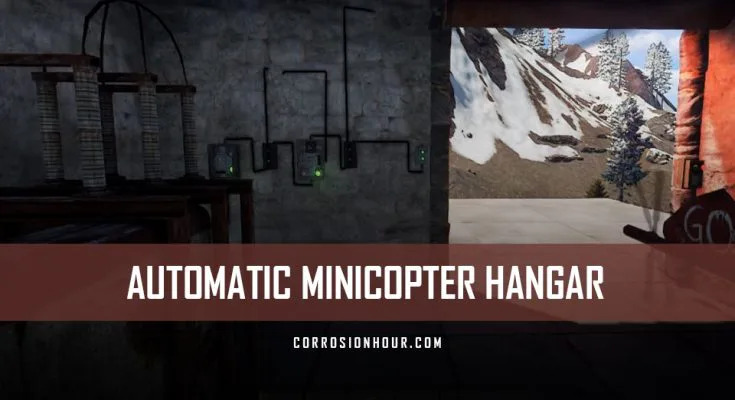 In this video, Quick Electric walks us through how to create an automatic minicopter hangar. This electric build is simple to follow and quick to wire up. While this specific electrical build is designed for the minicopter, it can be used with the other RUST vehicles, such as the RHIB or rowboat. Minicopters are highly valued on RUST servers, as there is a finite amount of them available at any given time. Having the ability to promptly leave a base and take off safely is crucial. Without an automatic hangar, players are at risk of being sniped. This risk is amplified when having to dismount and re-mount the minicopter to manually close the hangar door. The automatic minicopter hangar will become one of the most common electrical builds in the future, as its pattern is easy to remember and requires very little knowledge to set up. As mentioned above, this can also double up boat base designs, making it multi-purpose. Hey everybody, welcome to another video. 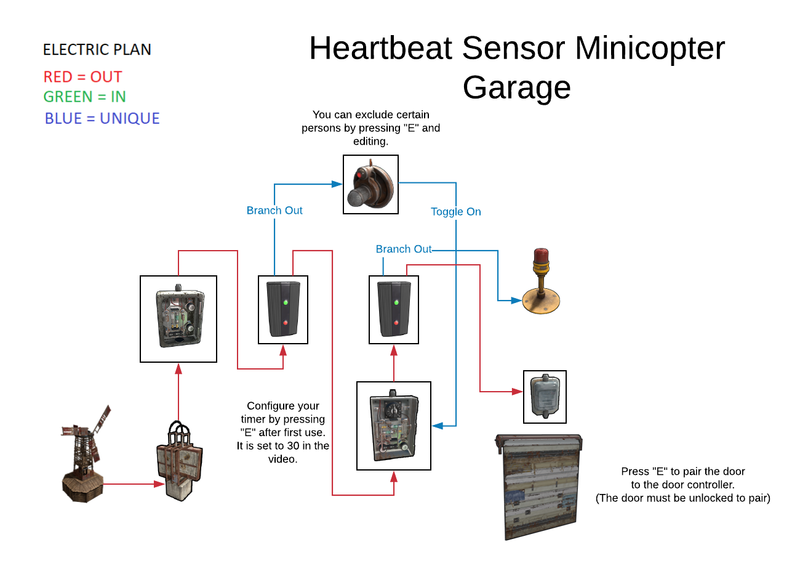 The video today is actually a multi-requested video showcasing the heartbeat sensor minicopter rooftop garage, if that’s not enough of a mouthful for you. The newly added minicopter is an extremely powerful and mobile vehicle, but I will say it is extremely difficult to learn how to drive, and there is a steep learning curve. With today’s build, we have a wind turbine atop a very large skyscraper base. Encased on the roof, is a 2×2, with a door frame for a garage door. Now let’s get right into the build. We have a large battery currently storing power. Let me change it to daytime. There we go. So from this build, it’s extremely simplistic, which is very nice. We’re going to need a heartbeat sensor, timer, two branches, a switch for the main power kill off, door controller, garage door, and key code lock. There was also the request of having essentially a light to show the location of the base as you approach as to where you’ll be parking in case you return at nighttime. And as just recently passed by the wonderful devs of Rust, the HPHF sensor, as of the next update, will not be glitched anymore with the removal of the exclusions or inclusions of the persons added. So let’s go ahead and get started with the build. We can start with just straight off the bat adding a garage door, opening that up just so it’s out of inventory and out of the way. We’re going to begin with our main power kill switch. As with any build, this is a switch placed there specifically to prevent a power drain. Now with this build though, the use of the large battery is very important, or a direct connection to the power source if you have nothing else in your base, due to the fact that this will be a live running circuit up until the point that you return, because you want it to auto-open the garage door for you so you can park your minicopter without the hassle of having to get out, open the door, get back in, and get into your garage. Now it runs off a timer circuit, so we’re going to start off with our branch here. Let’s see… We will attach the output of this directly to a power in of the branch. We will then add our heartbeat sensor, and our timer. So our timer is going to go right here on the wall with us, and the heartbeat sensor, I found for this build, one of the best locations is kind of center top mass of the external wall. So let’s go ahead and wire these up. The regular power out is going to go to the timer power end. And the branch out is going to come up here, just kinda eyeball it, into the power in of the heartbeat sensor. Next up, we are going to have our second branch out. We’ll just put it right here for now. Have our timer output lead directly into the second branch out. Now the reason being for the second branch out is to have both the siren light and the door controller, so the people that wanted the string of rooftop lights can use a branch, otherwise just put the door controller, it’s going to be a direct wire from the timer output. So we can now add on the final two pieces of the build. One being the siren light, which I find it to be nice right above the center of the garage door, just in case its pitch black in the evening and you don’t know where you’re parking. This will give you a clear understanding of where you should be going. As far as the door controller, we’re just going to plop it right here on the wall. Now we’ll pair that, garage door needs to be shut, and garage door needs to be unlocked. Once it is paired, you can add your code lock like so. And we can finish up the wiring. So we’re going to have our branch out of the timer branch come right out here to our siren light power in. And we’re going to have the main power out come right on over here into our door controller. Now none of this will be configurable until we power it up. So we’re going to activate the main power switch, we’re going to shut the garage door so that it’s at its default position, and we’ll flip the timer so that we can configure. You’ll see that the light will toggle, and the garage door will open. Now we want to configure our heartbeat sensor. We want to exclude others, meaning that the authorized players will be included. This is what we want. We want all the people within TC access to be included in this detection. And the way that you can tell if it’s the way you want it to be wired is you’ll see right now that there is no power output, meaning that it is excluding me, a TC authorized user as of right now. So we’re going to include authorized, which will now up this power output to one. And then you want to make sure that you’re not including others, because if you are to include others, that would mean anybody that happened to get up on your roof would be able to activate the heartbeat sensor and get into your base. Now that this is set up appropriately we’re going to hop right back in here and shut that. And then we are going to set a timer on here. Now I’ve found that thirty seconds is just the sweet spot in terms of getting the vehicle out, as well as returning the vehicle. So we can show right now that if we were to no clip out here and arrive at the destination, it should activate the door, but we’re missing a wire. We need the power out of the heartbeat sensor now that it’s configured, to come inside and go to the timer toggle on. So we’re gonna bring it right here, down, and in. We now have a fully completed circuit, and we can showcase the build. As we see now, when we toggle the heartbeat sensor now that it has authorized users and the power out is linked to the toggle of the timer, it will activate the timer and the siren light, and begin that thirty second countdown, which seems like a long amount of time, but as you’ll come to see with landing, it is quite a doozy. So we’re going to let that timer run out before we proceed with the demonstration. So assuming that you’ve just come to your roof of which this base I have not created a real base. But assuming that you’ve come to your roof in your garage loading bay and you plan to take out your vehicle, you will make sure you have fuel in, which we’ll top that off just in case. You’re come to come here and turn on your power switch which was already running. And then we’re going to toggle the timer which now means that you have thirty seconds to mount, get it running, lift it off just a bit, back up if you’re stuck in the wall which we don’t want to be, until you can go into drive mode which we are now in, back up out of the garage, and begin our takeoff to leave. You’ll have to pardon my driving because I’m still learning, but I think I’ve got enough of a hang of it to at least demonstrate this somewhat. So you would leave to wherever you’re going with your base, and obviously I’m not going to go anywhere significant, I’m just waiting out the timer. And then we’re going to pretend as if we’re making a return trip back to our base now. So as you’ll see you have your tower base spotted. Now I find that an aerial approach from the front is typically the easiest, but it’s all going to depend how much room you have in your base, depending on your resources and materials, but for this base it’s simply a 2×2 garage along with a 2×2, well 2×4 in a sense, landing strip. Now you’re going to want to pull back on it as you approach your landing destination, and you can remember that the driving mode is your best friend. So as we approach and get within the area, you’ll see that the garage door and the light siren is going to detect you, open the garage door, give you thirty seconds to pull your bad boy in here, and hop on out. Now the timer is all up to you. For me thirty seconds seemed to be just about the right amount of time with how novice I am at driving, but you may find that it’s just way too long. If that’s the case you come right here, turn off the main power kill switch which you will be doing anyway anytime you re-enter your base, and the garage door will shut. Resetting everything, and now it’s active again for your next trip out. This was a quick and simple build, and I appreciate everybody for their ongoing support. The Discord has begun to liven up, and it’s always fun to do builds with viewers and help them with their questions, as well as learn quite a bit from them as well. I’d like to thank the people in the comments for letting me know about the key binds for the N destroy as well as the no clip bindings that has made my life extremely improved. Thanks everybody and have a nice day.